Cryptotaenia canadensis (L. ) DC. Stems: Erect, branched distally, glabrous, frequently hollow. Leaves: Basal and cauline, alternate, simple or compound. Basal leaves: petiole 2.7 to 8 inches; blade ternately compound, ovate to oblong-ovate in outline, 1.2 to 5 inches long 2 to 4 inches wide; leaflets obovate to rhombic or oblong-lanceolate, 1.2 to 6.3 inches wide, margins doubly serrate to 2-3-lobed, ultimate segments 1.2 to 3.1 inches wide, surfaces glabrous. Cauline leaves gradually reduced distally on stem; petiole present or absent; blade ternately compound to 3-lobed or lanceolate. Inflorescences: Terminal and axillary, compound umbels; peduncles .6 to 3 inches; involucral bracts 0(-1); rays 2-7, unequal, .4 to 2.4 inches; umbellets 2-10-flowered; involucel bractlets 0-3, narrowly lanceolate, .08 to .16 inch. Pedicels .08 to 1.2 inch. Flowers: Calyx lobes absent or minute; petals 5, white, obovate, tips usually elongate and curled inward; stamens 5, filaments distinct; pistil 1, 2-carpellate; ovary inferior, 2-locular; styles 2, often swollen at base; stigmas 2. Fruits: Schizocarps, splitting at maturity into 2 mericarps, fusiform, slightly flattened at right angle to commissure, .14 to .3 inch long, .06 to .12 inch wide, glabrous; mericarps each usually suspended from slender stalk (carpophore), dark brown, ribs with 5 longitudinal, not corky, not winged, oil tubes conspicuous; seeds 1 per mericarp. 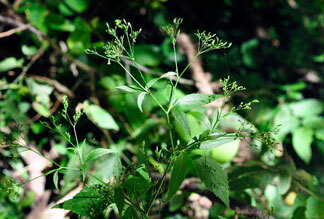 Comments: Honewort is cultivated in Japan; the roots, stems, and leaves are cooked and eaten. Cryptotaenia, hidden and little band, alluding to the concealed oil tubes of the fruits and Canadensis, of Canada. The only species of this genus in Kansas.